Do you know how to tell which Zebra is in charge? 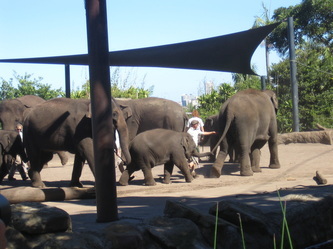 It’s the one with the biggest bottom! 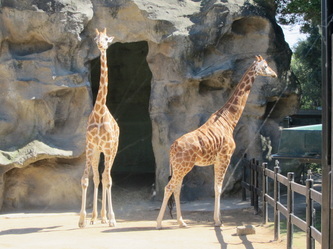 There are two young male zebras at Taronga Zoo, part of a much larger breeding herd based at Dubbo. 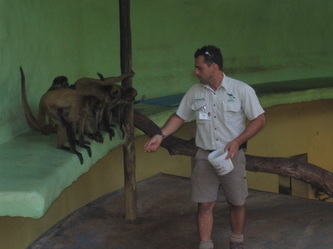 A short while after they arrived, one of the zebra’s bottoms began to grow, and it became obvious that he was the dominant male! 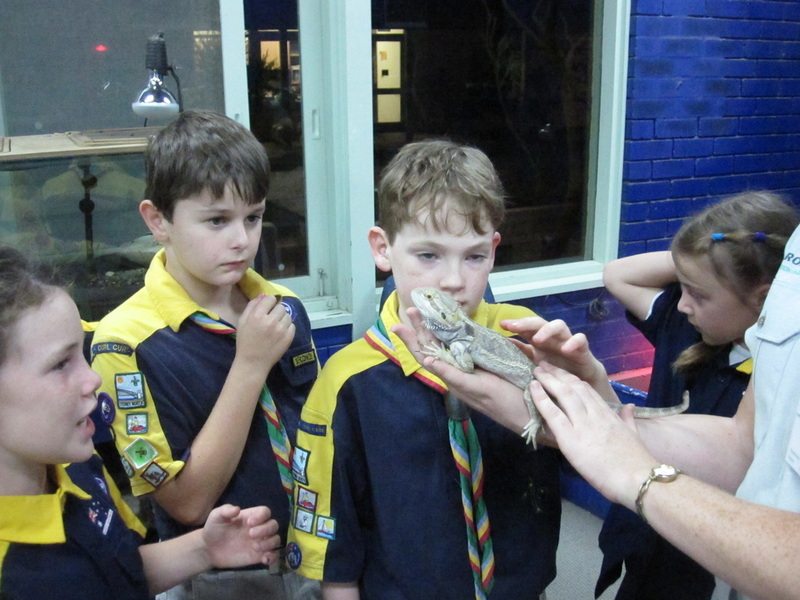 This was one of the fascinating things that Brookvale – Curl Curl group learnt when they went to a ZoosnooZ on the Thursday night before Easter. 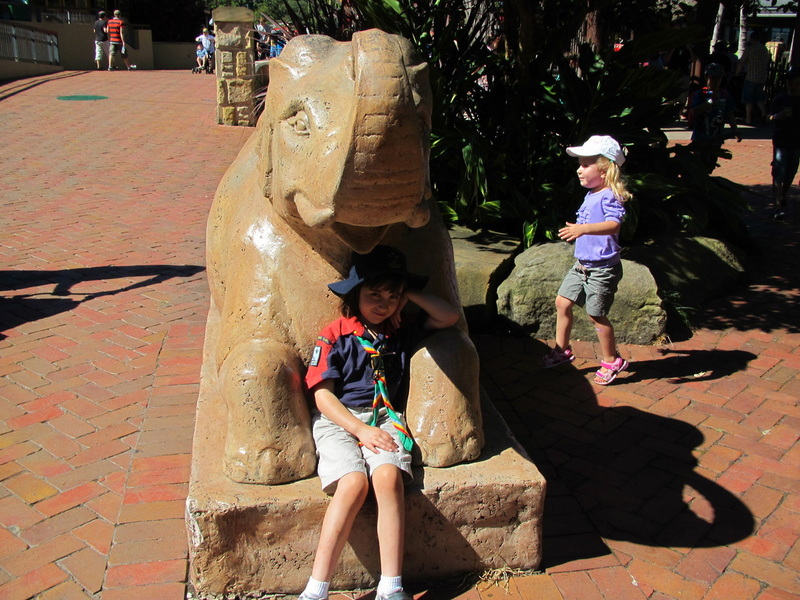 They met up at their scout hall and carpooled the short trip to the Zoo. There were 26 Cubs and Scouts and four leaders ready to spend a night with the animals. 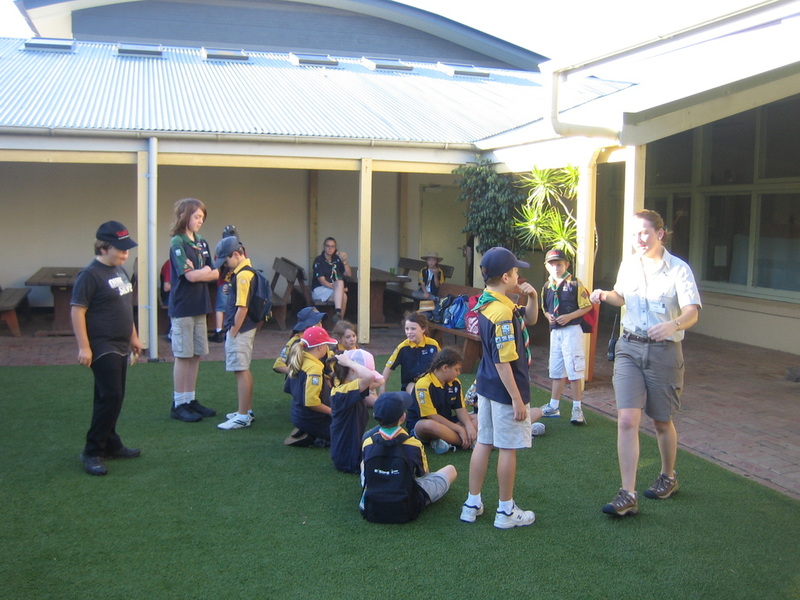 They arrived at 6pm to be met by their hosts Liz and Caitlyn from the Education Centre. They had a barbeque dinner then went for a special night time private tour of the zoo. The Cubs and Scouts had to be as quiet as possible. The hosts had special red torches so that the animals were not startled by bright lights. 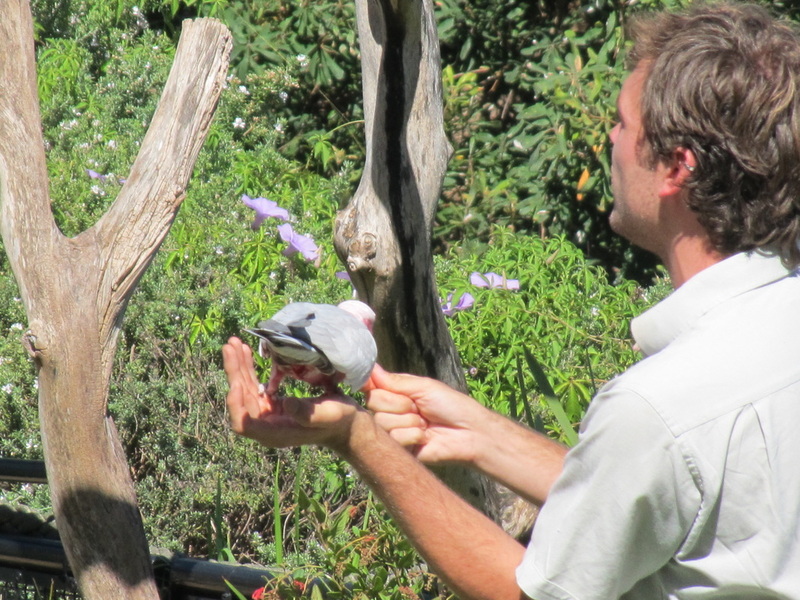 They saw many of the large animals including lions and giraffes. 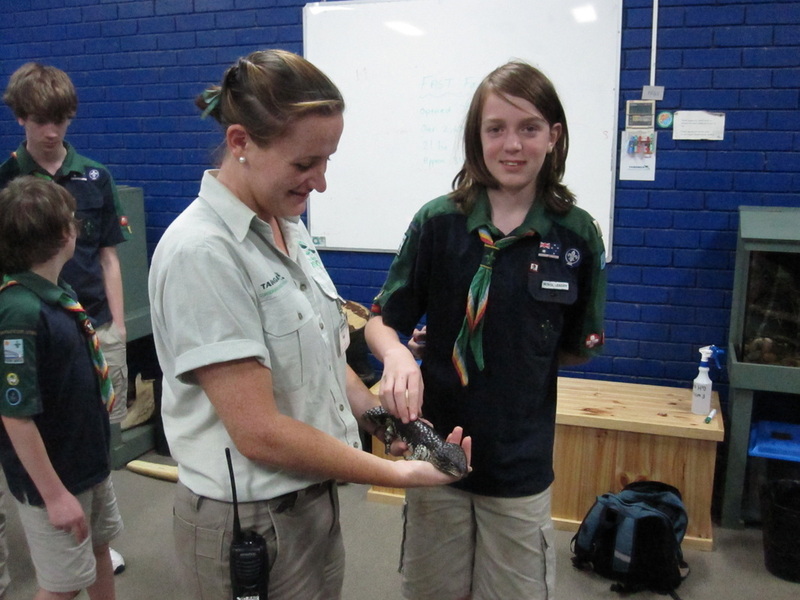 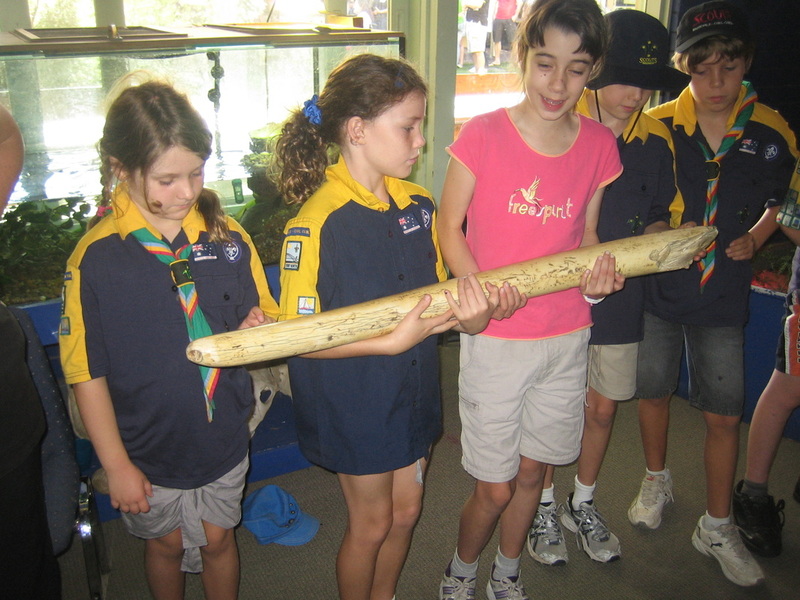 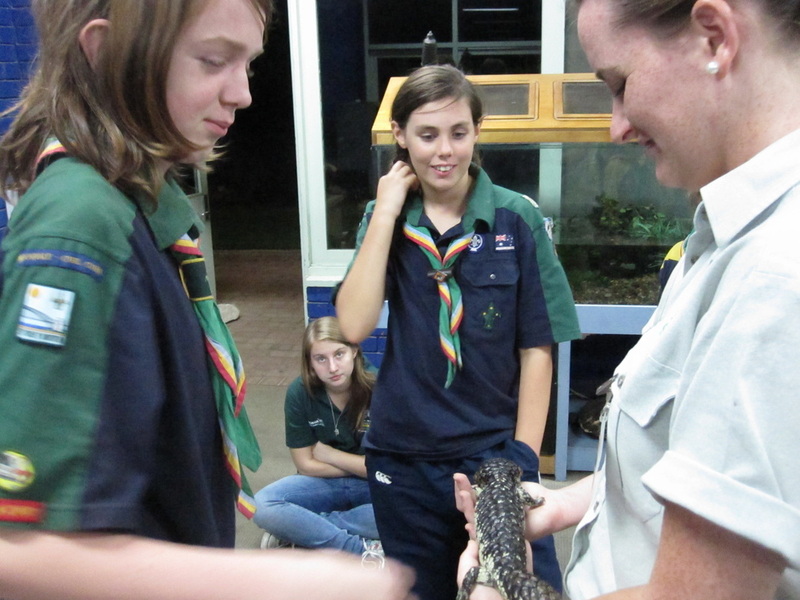 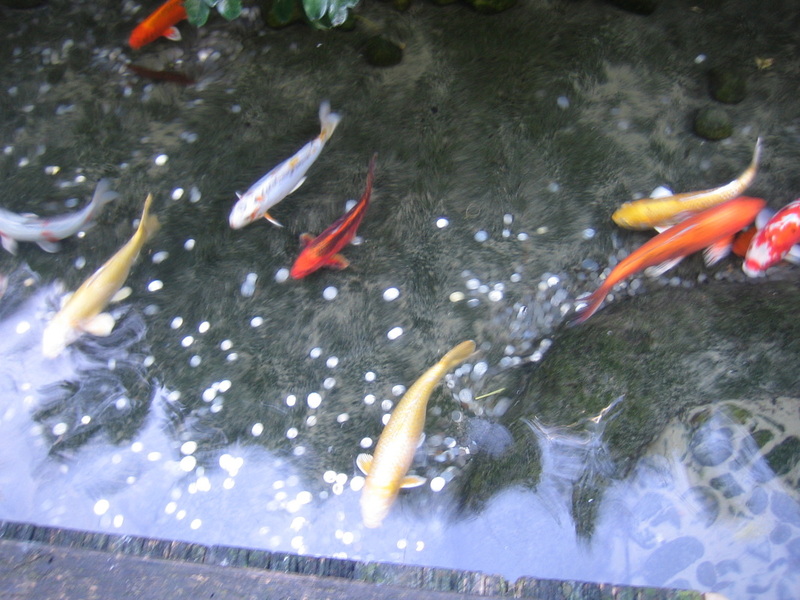 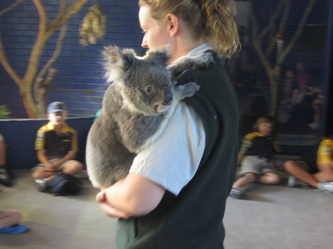 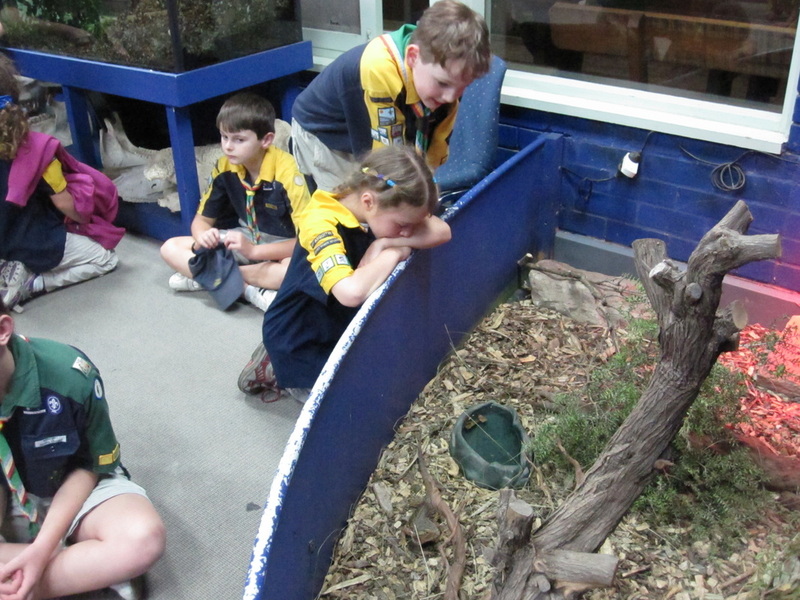 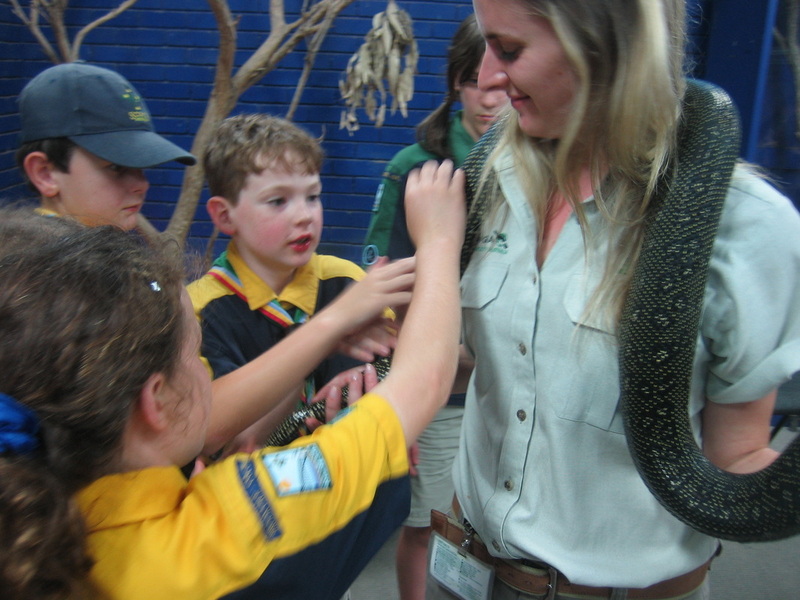 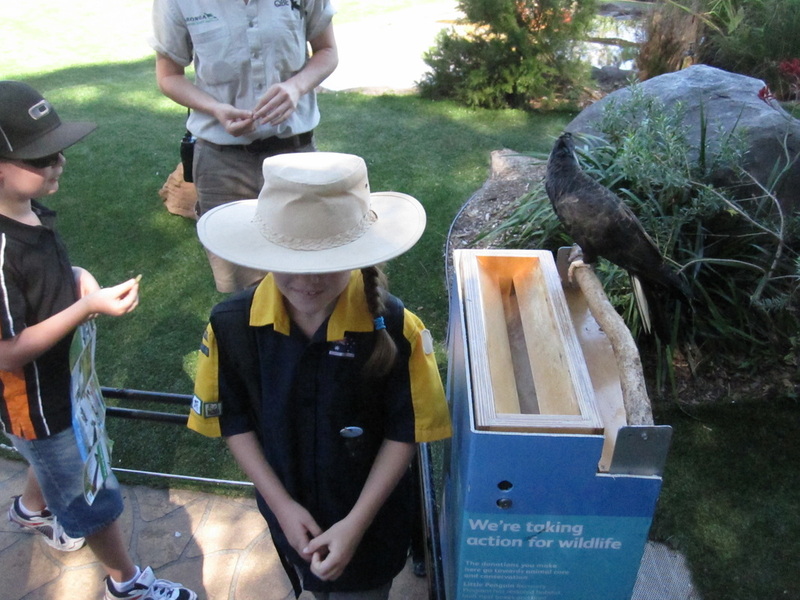 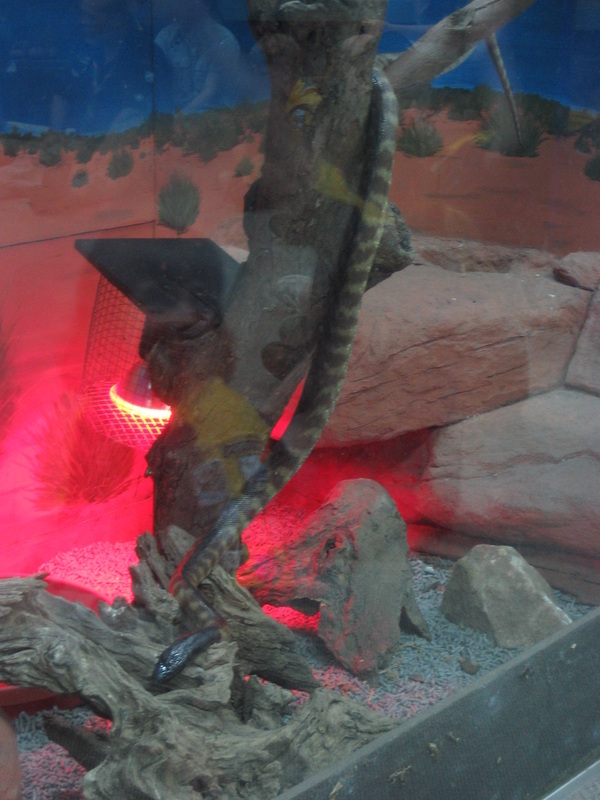 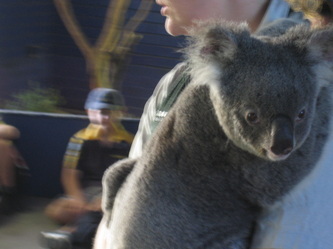 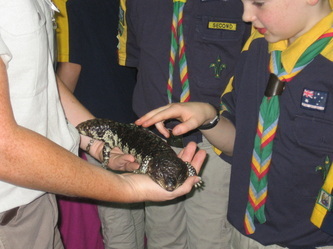 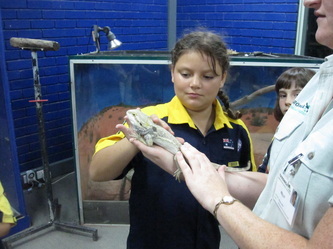 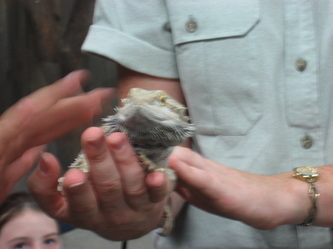 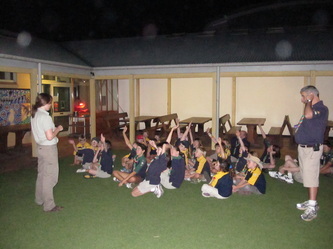 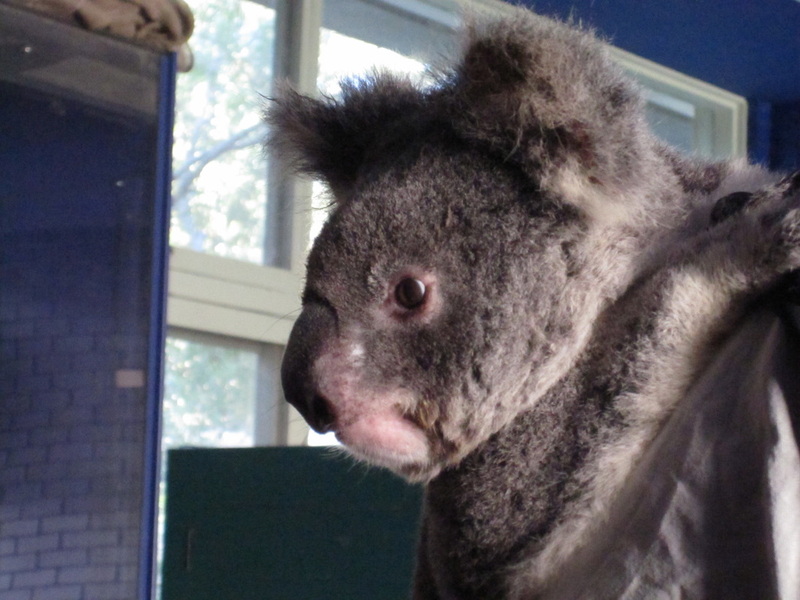 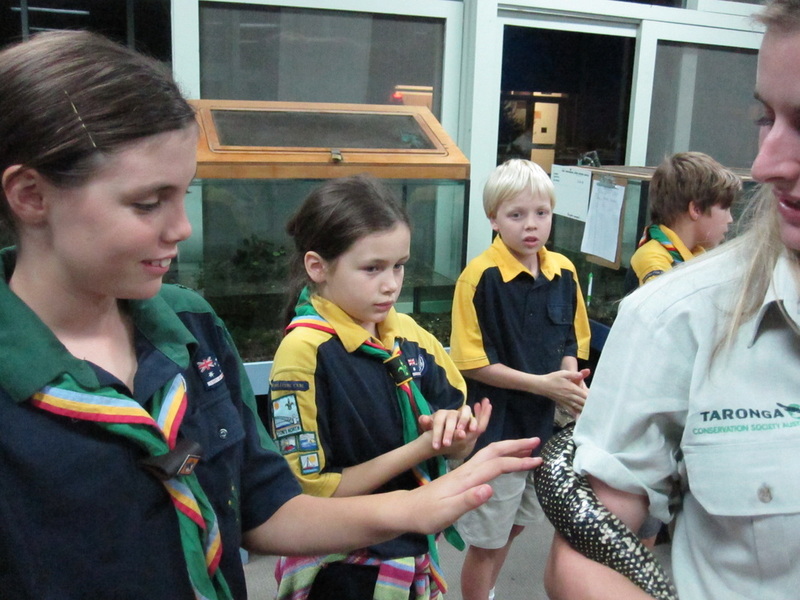 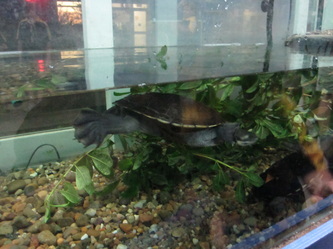 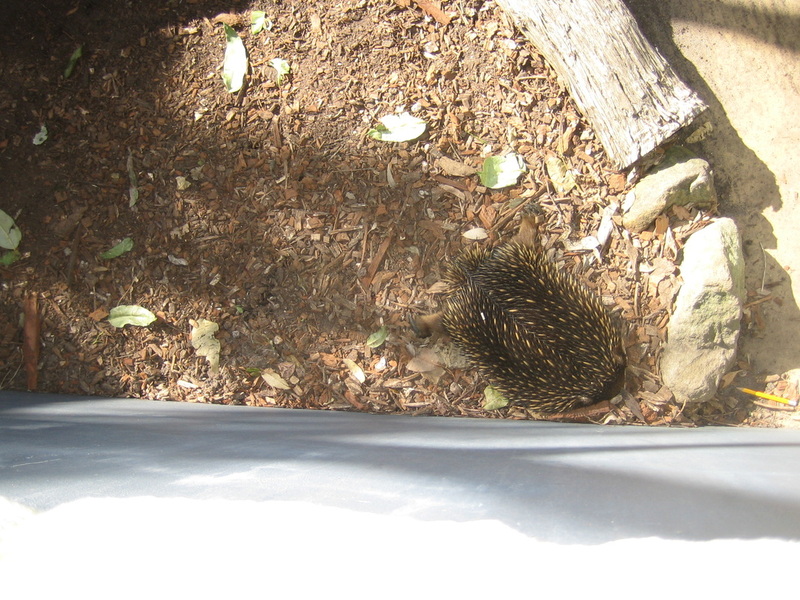 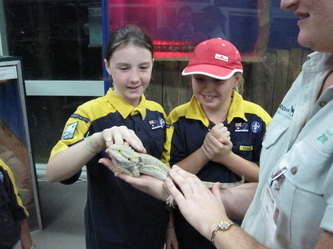 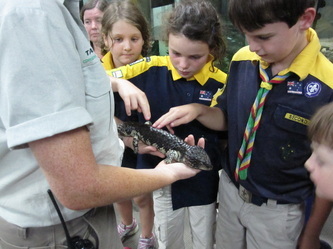 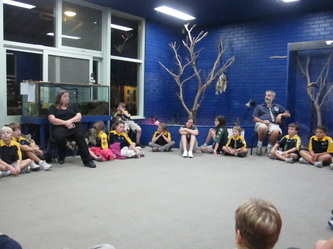 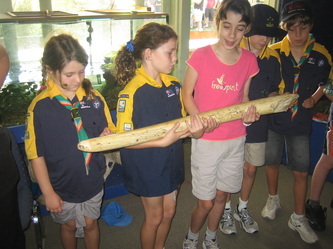 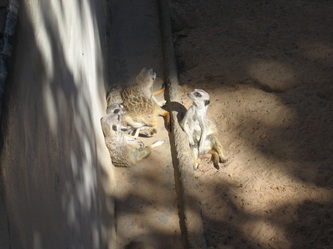 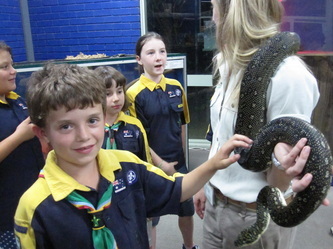 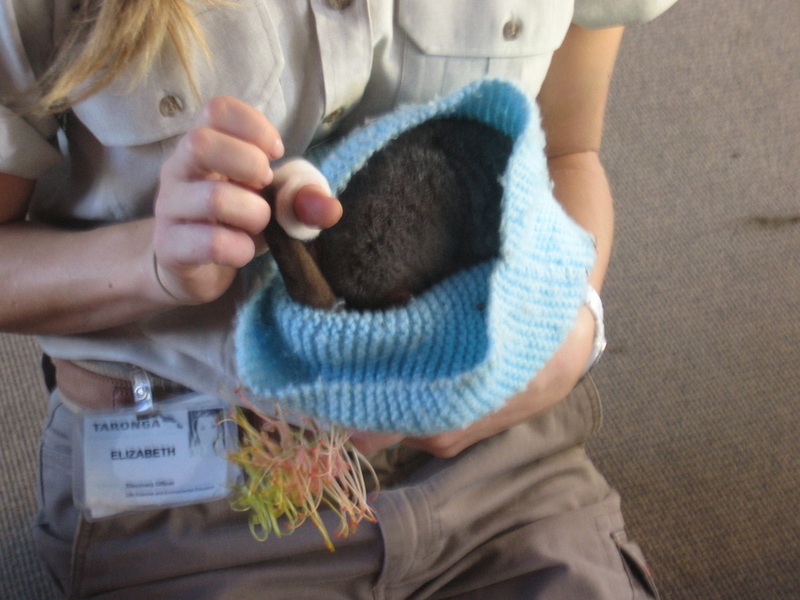 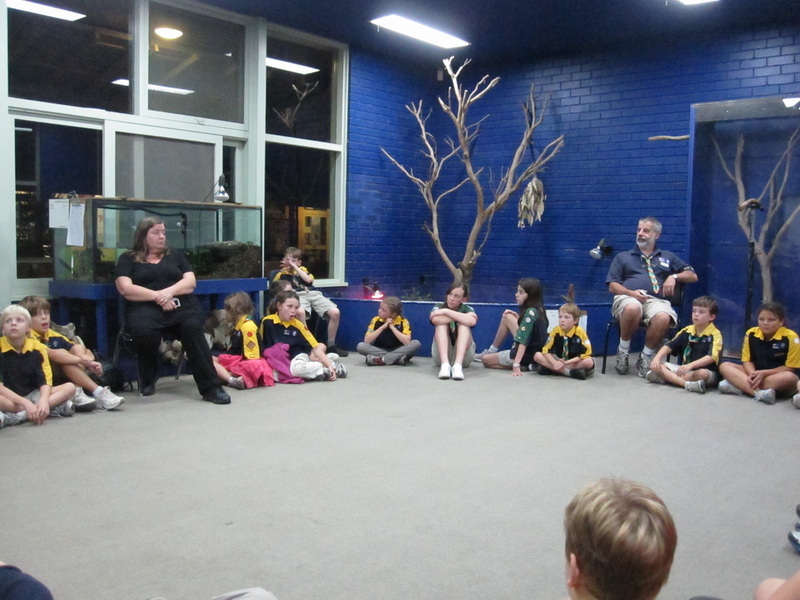 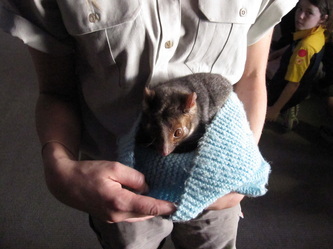 Afterwards they were shown different native animals in the education centre before going to bed for the night. They slept in a big room that overlooked alligator alley. 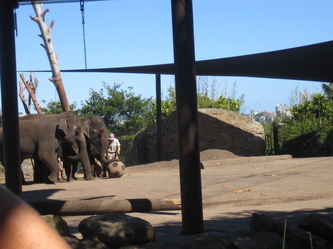 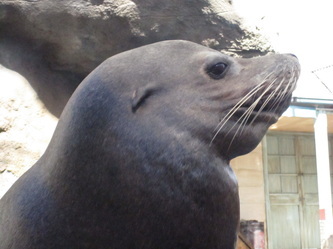 This is an exhibit at the zoo that could only be seen from the large glass windows of their room. 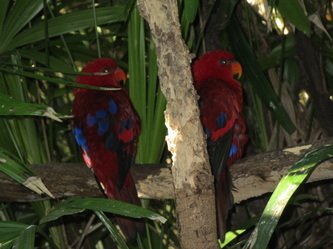 There were red lights shining in the trees with small furry animals curled up underneath them. 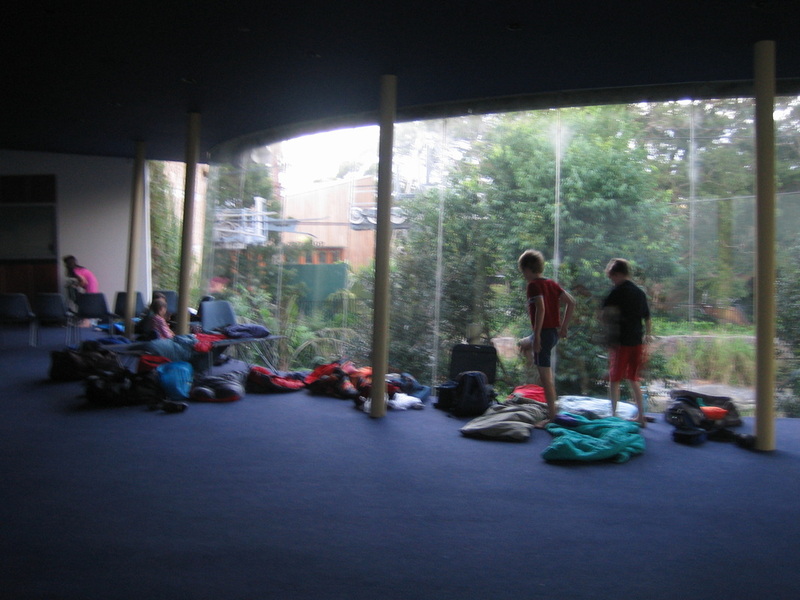 At dawn the next day all the scouts woke up to watch lots of small cute monkeys scamper throughout the trees. 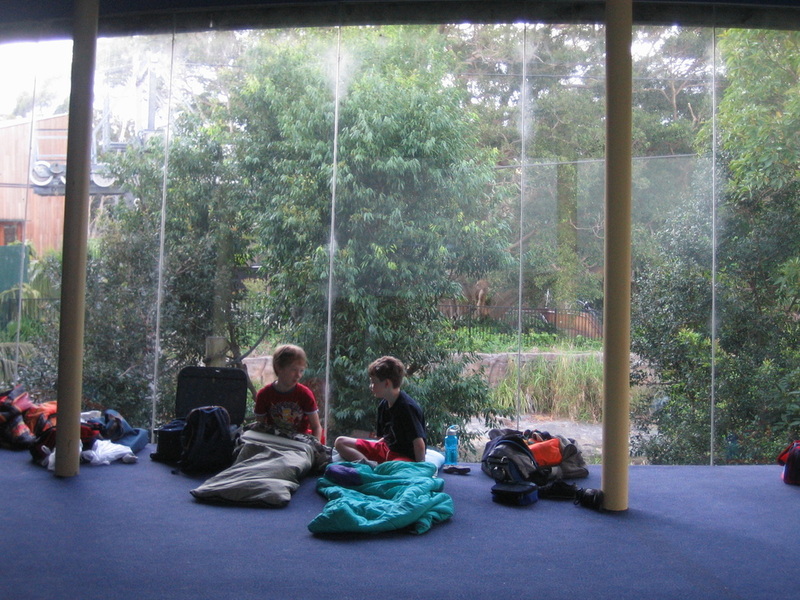 They got up for breakfast then went for another tour of the zoo before it was open. One highlight was seeing the platypuses swimming in their exhibit, before the noise and crowds scared them into hiding. They met the Tasmanian Devil zoo keeper who took them behind the scenes and showed them what she had in her freezer. 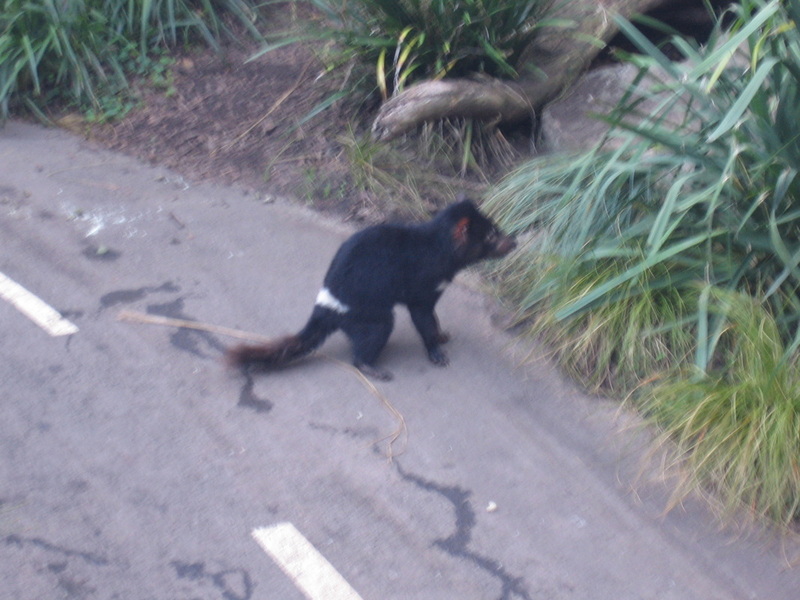 Tasmanian Devils like to eat dead meat. 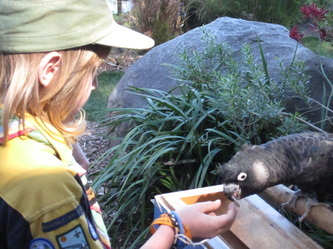 One of their favourite things is a Blood-icle, frozen blood with dog biscuits in it. 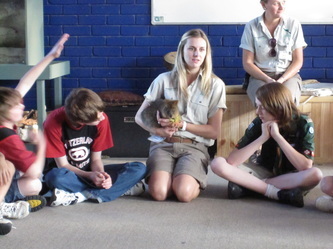 Liz and Caitlin taught the Cubs and Scouts all about animals local to the area and how feral animals and human development are affecting their habitat. 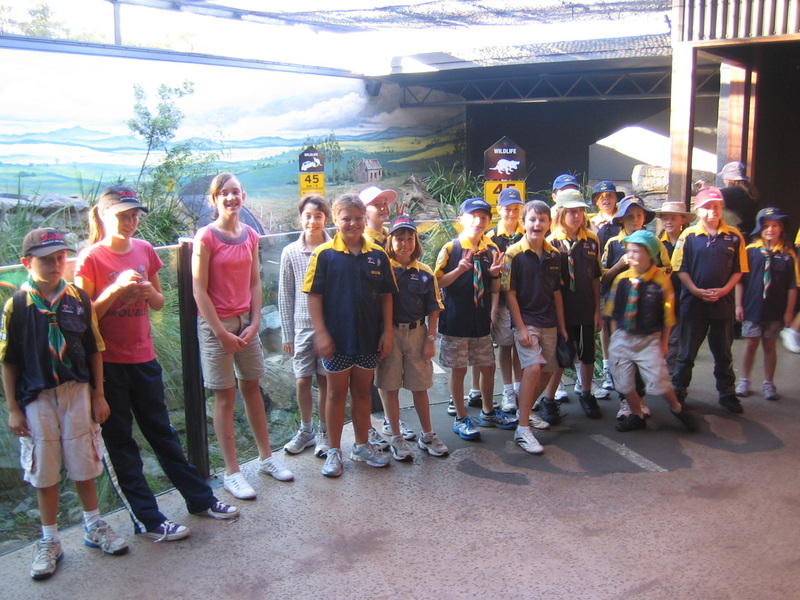 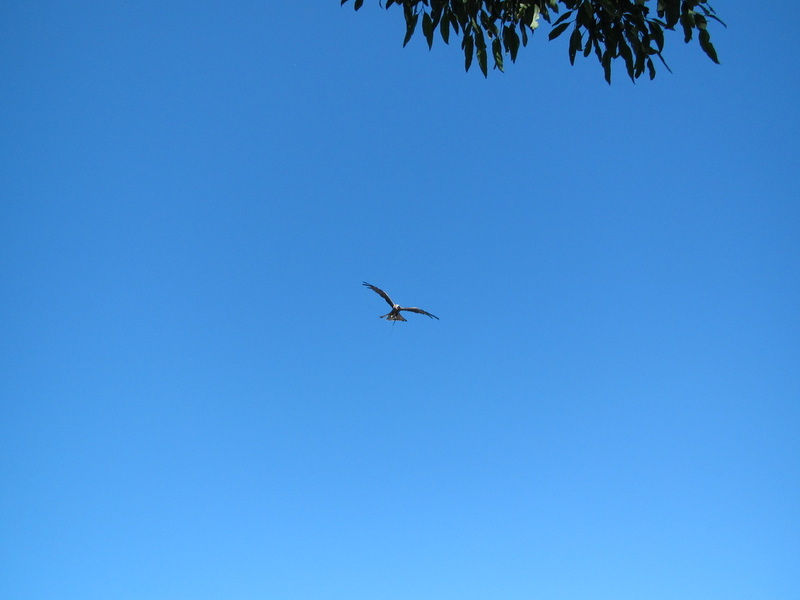 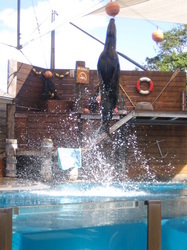 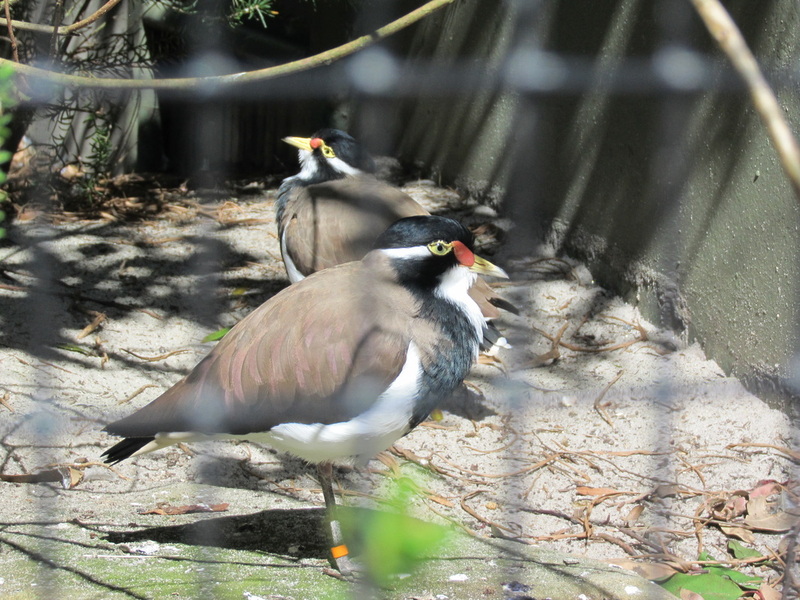 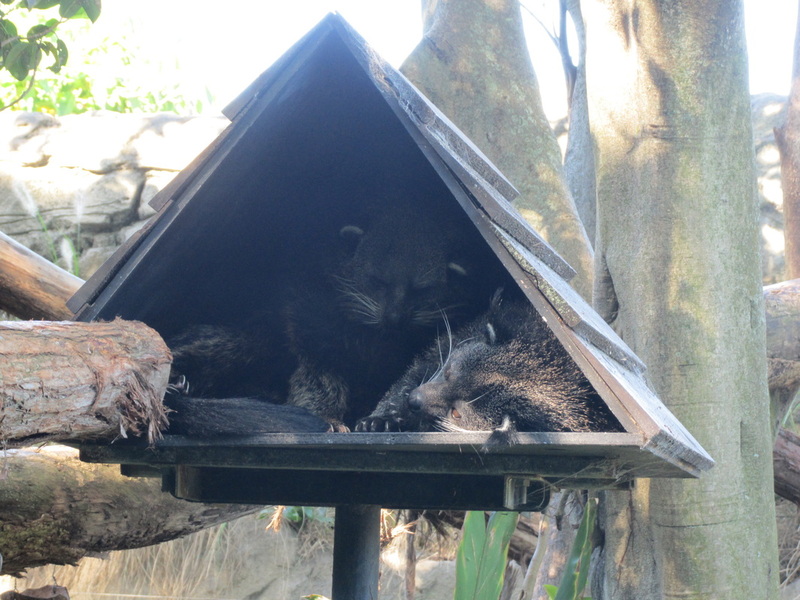 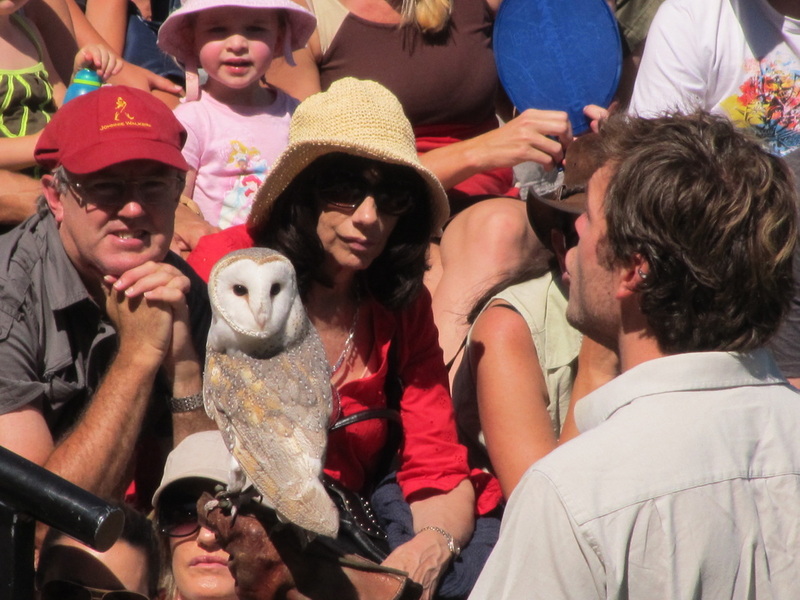 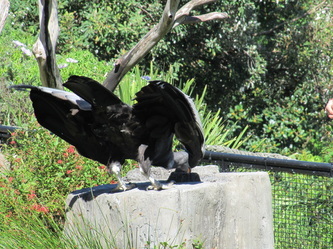 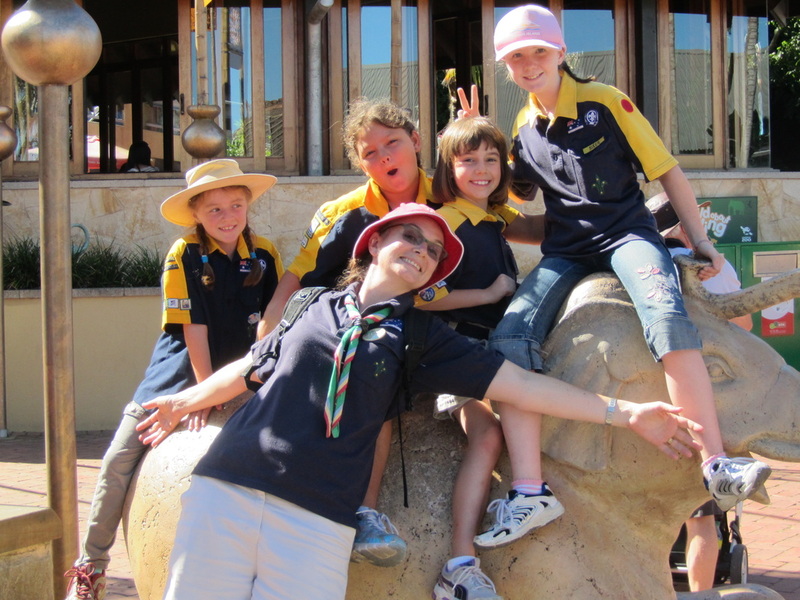 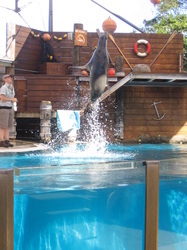 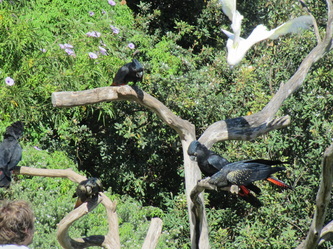 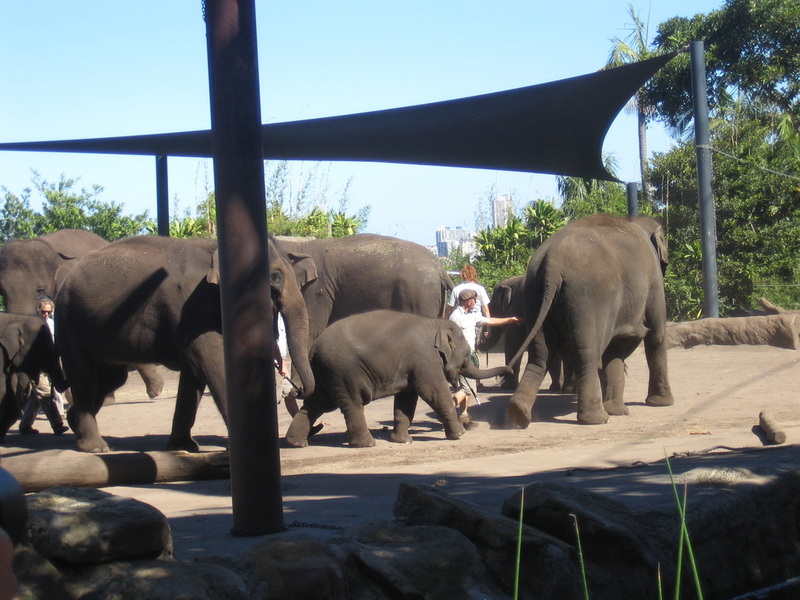 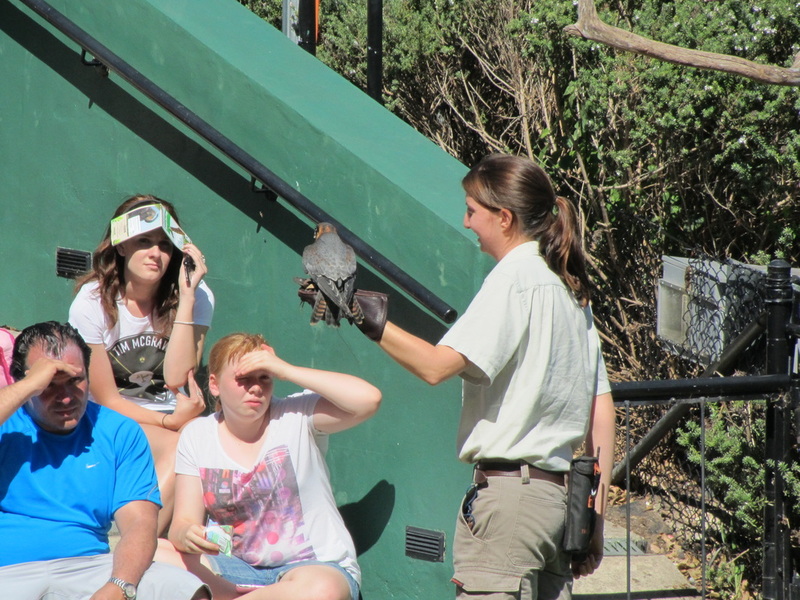 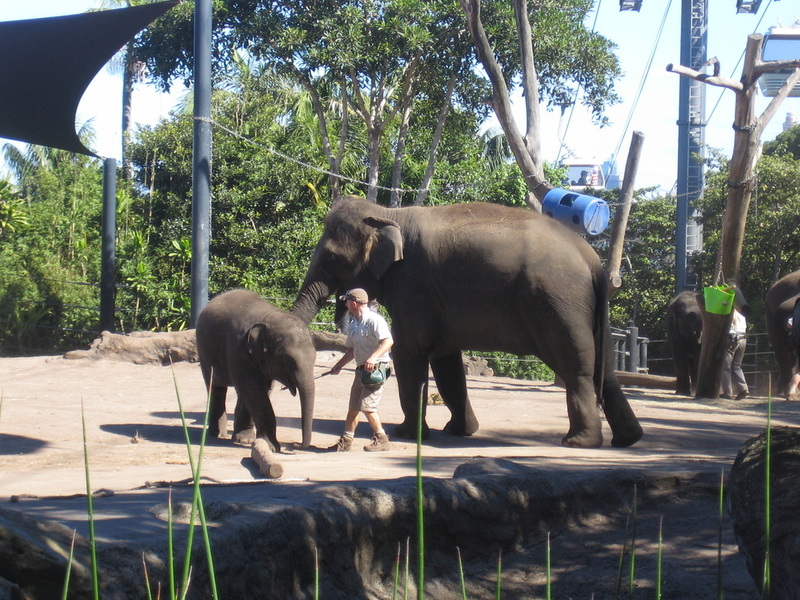 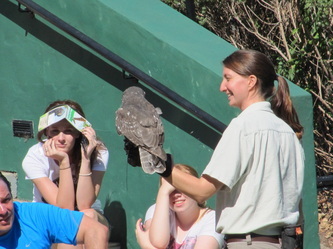 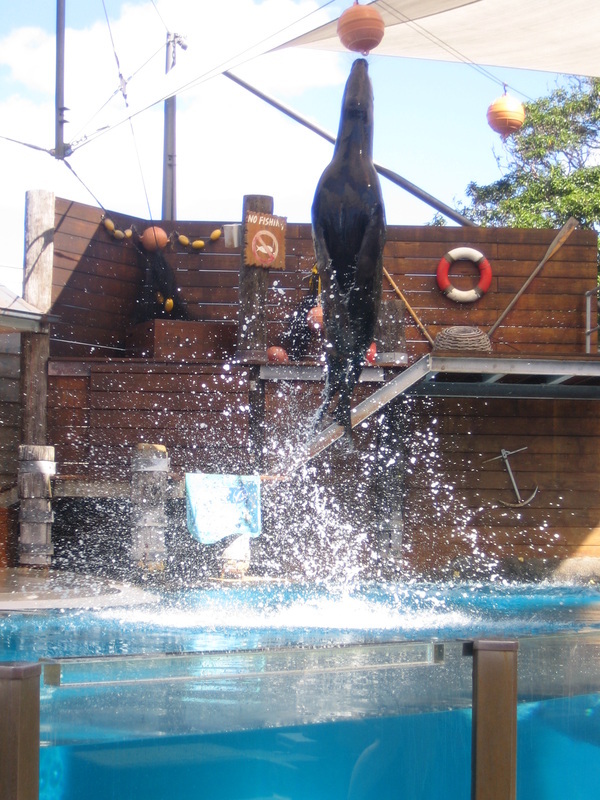 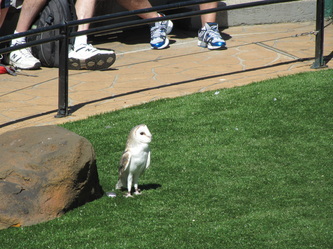 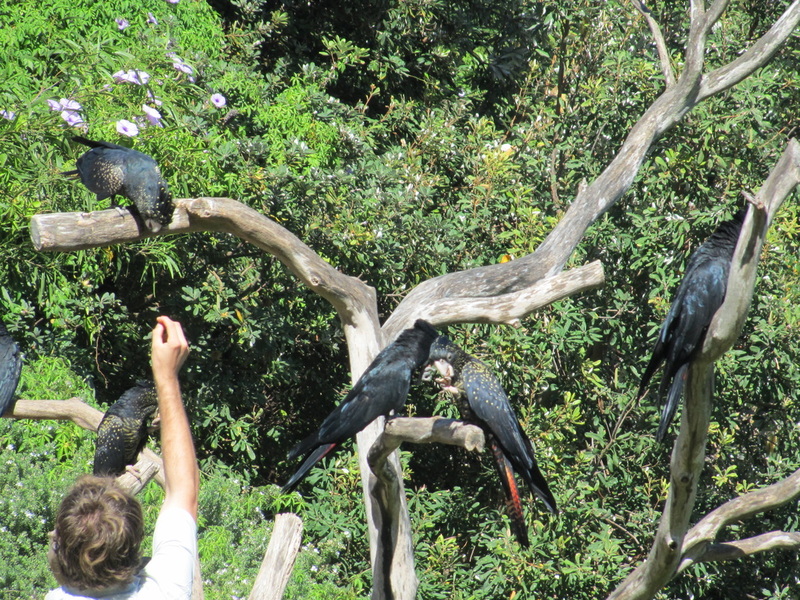 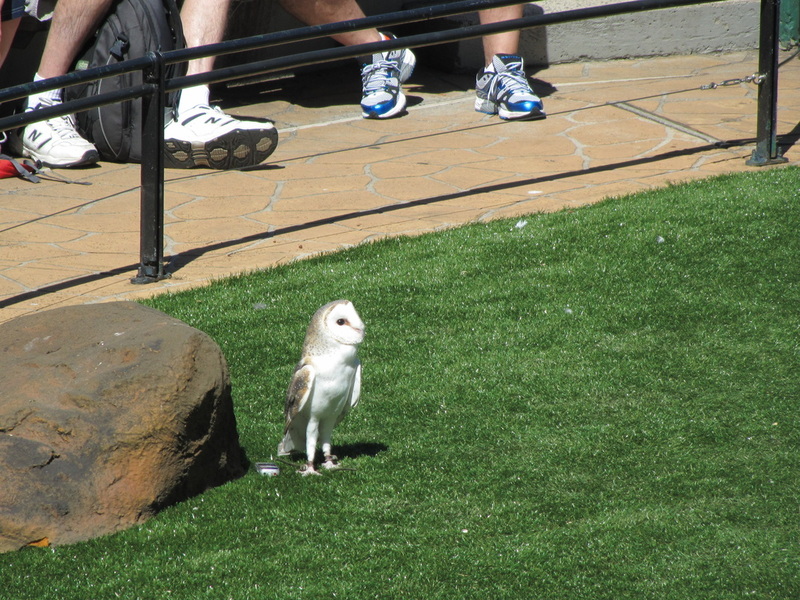 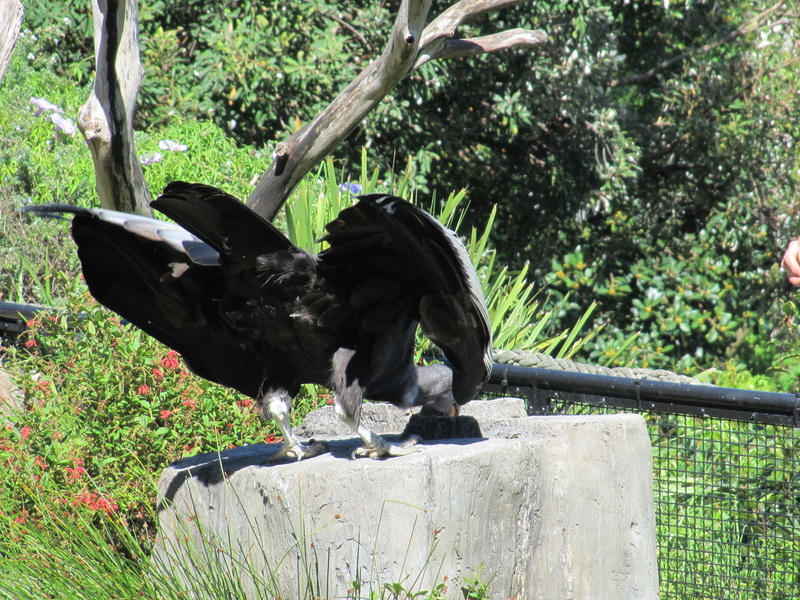 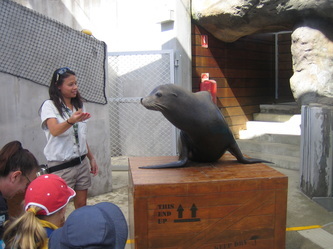 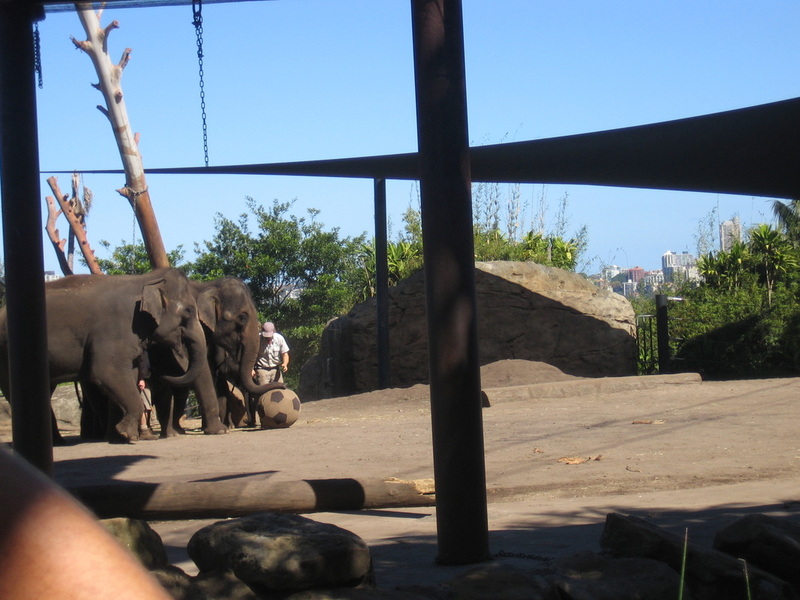 They went back to the Education Centre to pack away their bags and then spent the day at the zoo, where they saw the Seal Show, with seats right up the front and the Free Flight Bird Show, where owls swept just over their heads. 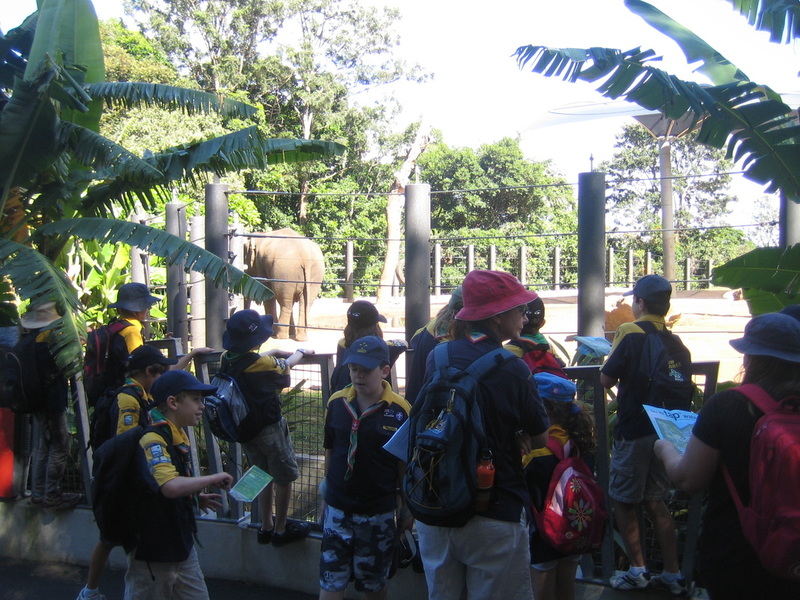 They caught the Sky Safari back to the top and were met at the front gate by their parents in the afternoon. Everyone was glad that it was such beautiful weather with the sun shining all day. 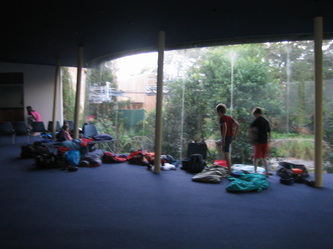 However they were very tired, especially the leaders, by the time everyone went home. The Cubs had learnt a lot and were able to work on their Animals and Birds Achievement badge over the holidays and the Scouts could complete much of the Science Proficiency badge. 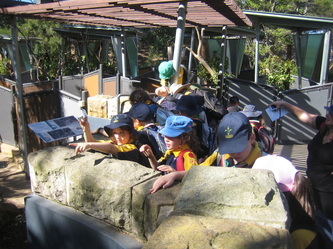 During our time at the zoo we learned enough to complete the Animals and Birds Level 1 badge. 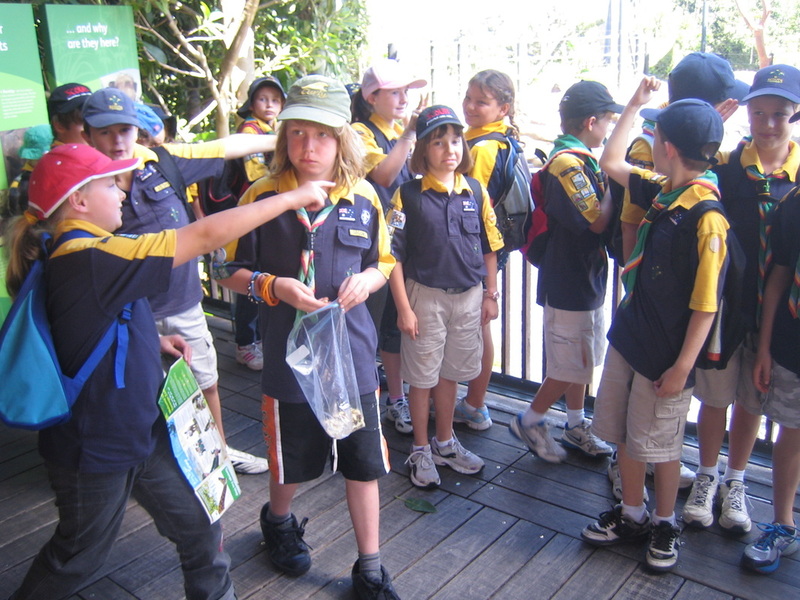 To be awarded the badge each Cub Scout needs to complete the worksheet below. Makes an excellent holiday activity. Complete the sections of the workbook using the animals and birds we saw at the Zoo and what our hosts Caitlyn and Liz talked about. 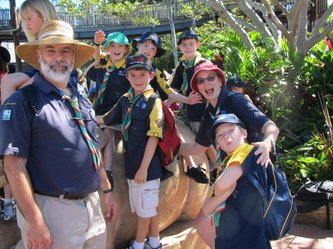 Bring it along on the first week of Cubs, and you'll qualify for the Animals and Birds achievement badge! 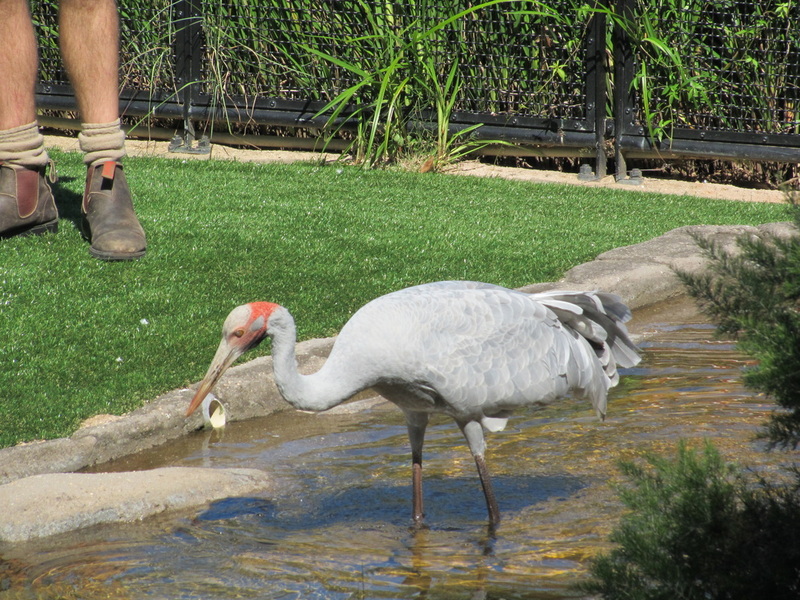 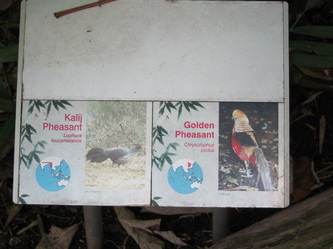 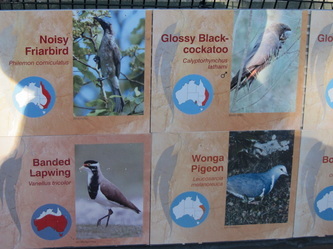 There are some hints below, also have a look at http://www.taronga.org.au/animal/search/continent?continent=Australia for a long list of Australian animals. 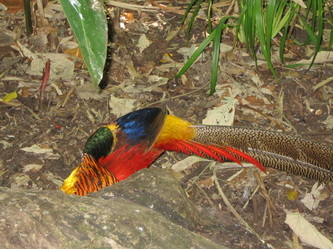 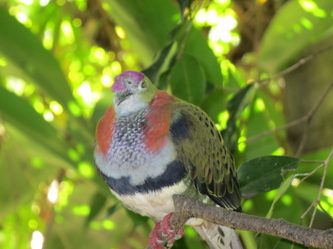 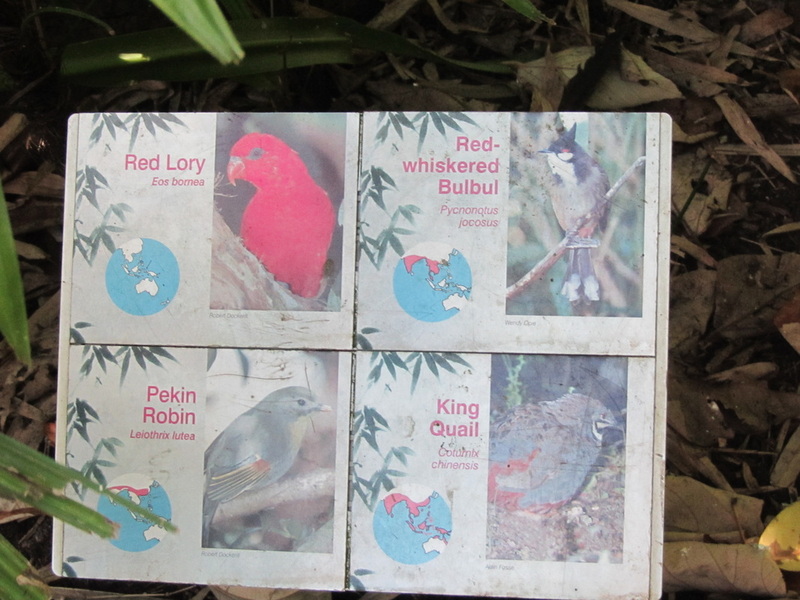 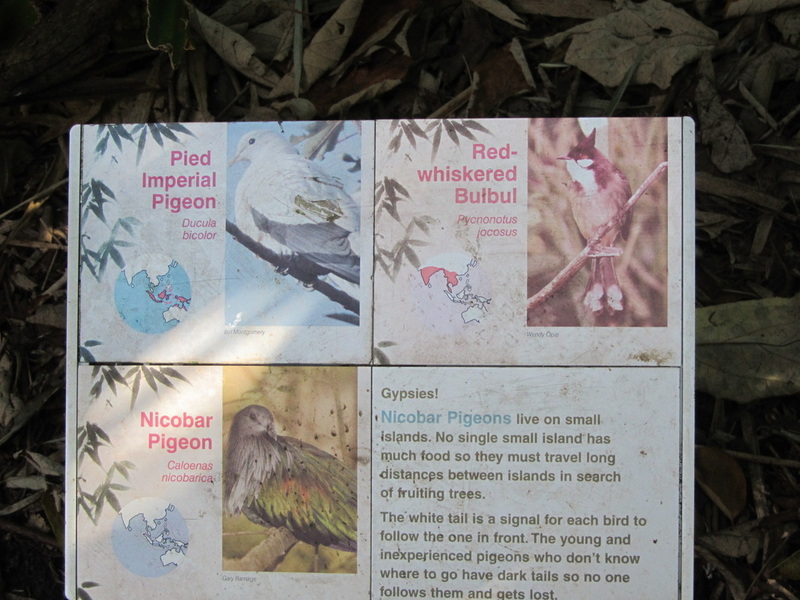 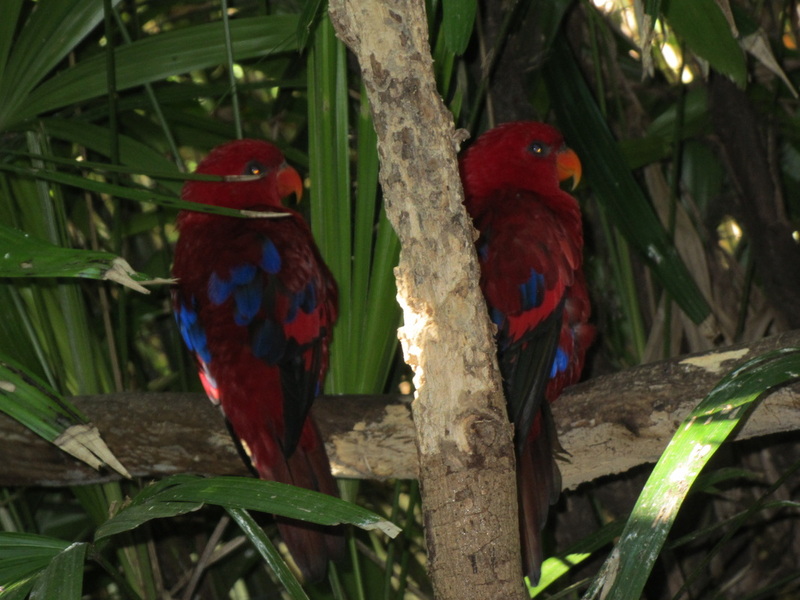 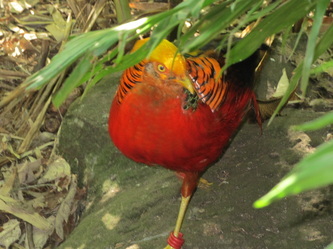 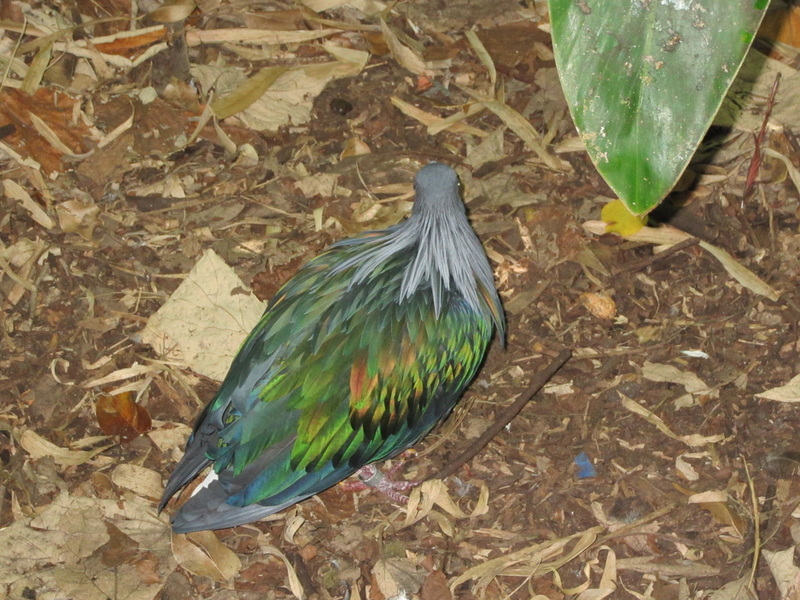 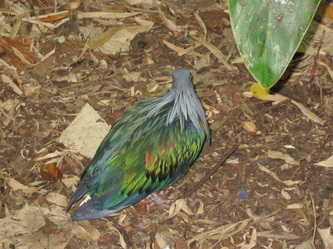 Birds we saw in the aviary: king parrot, regent bower bird, rainbow lorikeet, emerald dove, superb fruit dove, noisy pitta, white headed pigeon, golden pheasant. Birds we saw in the bird show: black kite, brolga, barking owl, barn owl, red tail black cockatoo, Andean condor, peregrine falcon. 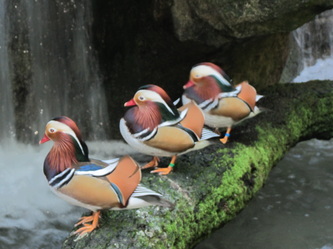 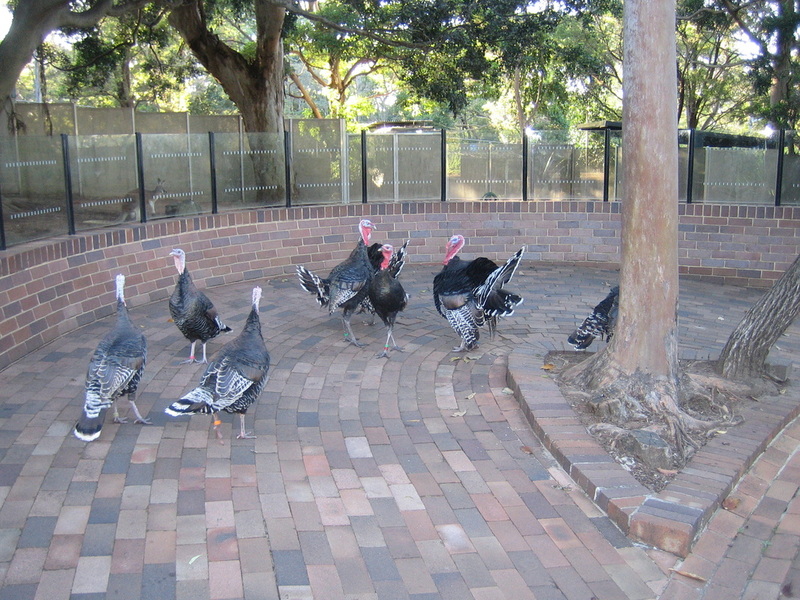 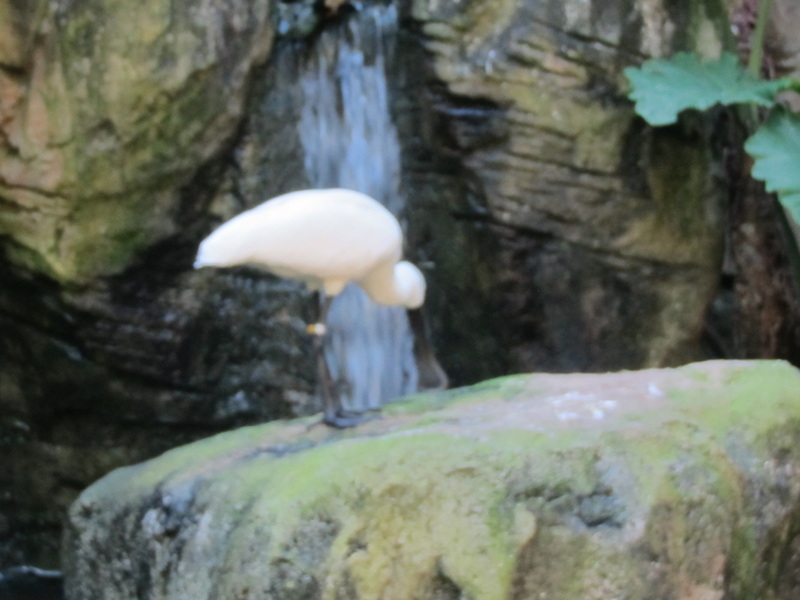 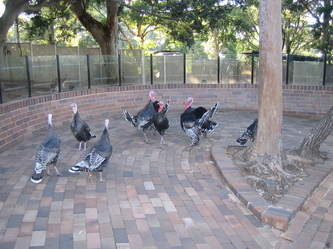 Birds we saw around the zoo: little penguin, goose, turkey. 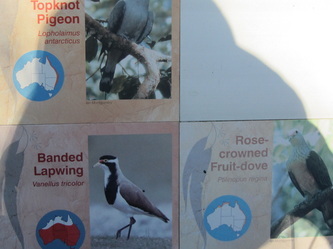 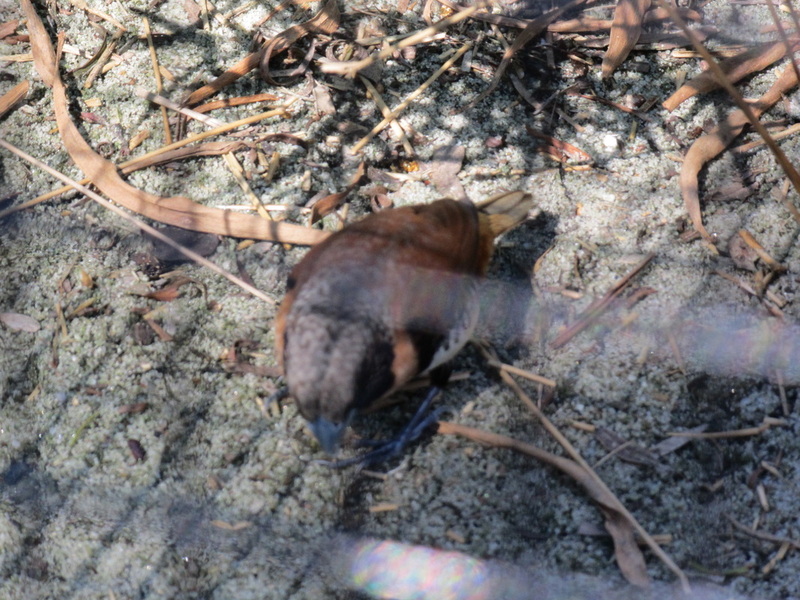 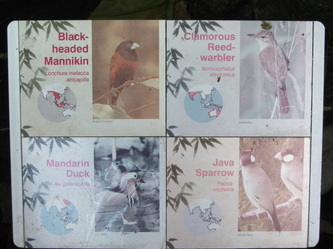 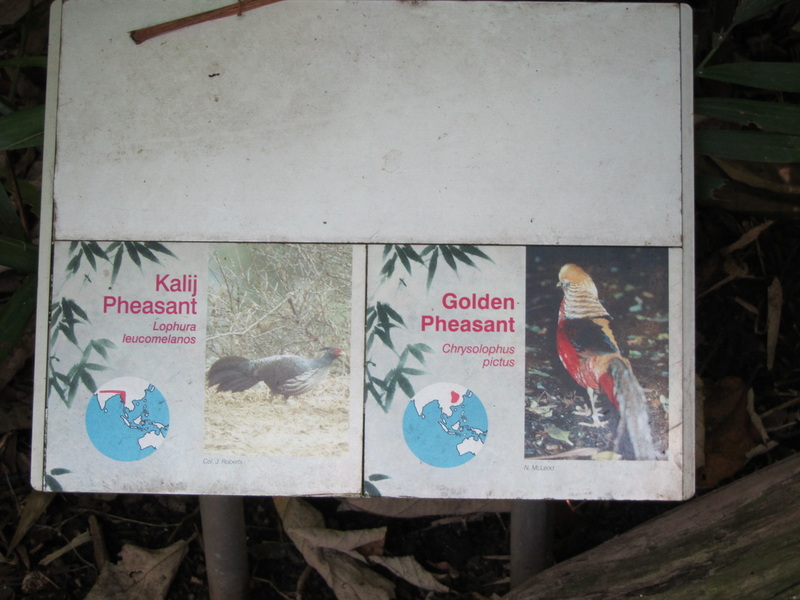 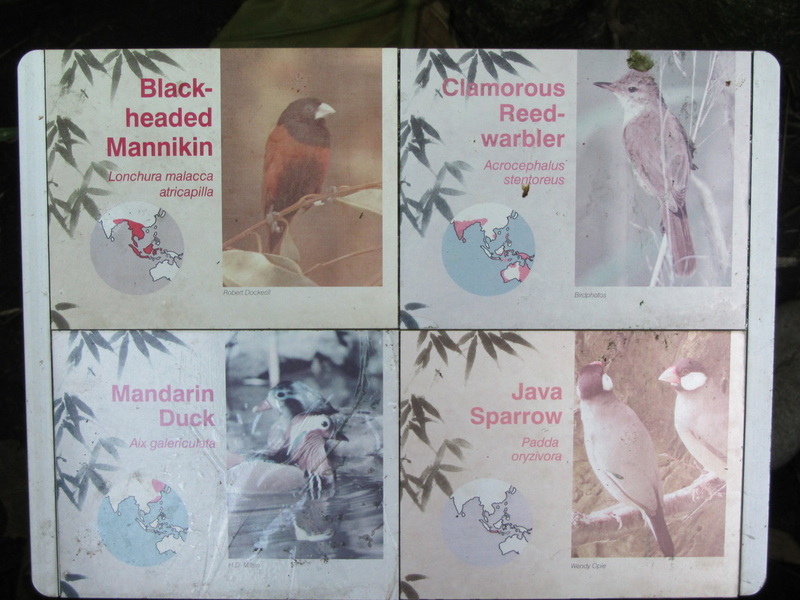 Match the bird photos below with the correct names. 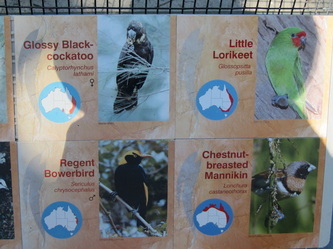 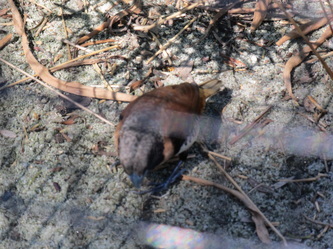 Some of the Australian animals we saw and touched: swamp wallaby, Tasmanian devil, emu, grey kangaroo, red neck wallaby, red kangaroo, koala, water dragon, ring tail possum, brush tail possum, shingle back lizard, bearded dragon, diamond python, platypus, quokka. Other animals: Sumatran tigers, African lions, komodo dragon, bongo, giraffe, Californian sea lion, giraffe, Barbary sheep, African elephant. Match the animal photos with the correct names.